I have to say that I truly enjoyed the Toradora Series. I usually don't go out of my way to watch every anime made available but after watching a few episodes of Toradora, I got hooked. Hooked enough to borrow the series and watch it marathon style. Yeah, my eyes are still bulging from watching it. 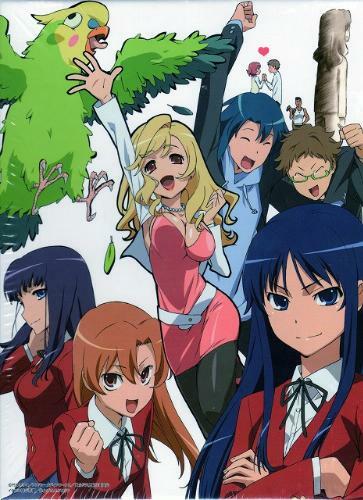 The series revolves around two protagonists, Ryuuji Takasu, Taiga Aisaka and their friends. Their friends being, overachieving Yuusaka Kitamura, sporty Minori Kushieda and narcissistic Ami Kawashima. Ryuuji Takasu grew up in a single mother household having never known his father. Since his mom works during the night time he is left to take care of the household chores. Taiga Aisaka meanwhile is a very petite girl with a fierceness and spitefulness that doesn't reflect her diminutive stature. She lives alone in her apartment (known as a "mansion" in Japanese) that is provided for by her divorced parents. Both of them are neighbors with Taiga's mansion building towering over the small house of Ryuuji, effectively blocking out the sun. Taiga's window is also level with Ryuuji's, making this one of their means of speaking to one another. The series originally started as a manga then due to its popularity got made into a 25 episode anime. The stories are heartwarming and touch on the basic events of your typical Japanese school and the troubles that teens normally go through. Such as teenage angst over crushes and fear of rejection, part time work, financial problems and complex family relationships. Spliced with that are the comedic jibes that make it a truly interesting series to watch. 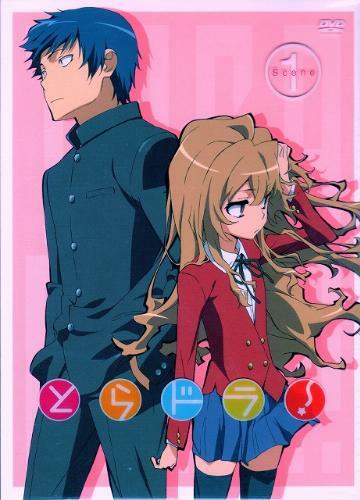 The title "toradora" comes from the two characters. Taiga's name literally means "Tiger" when spelled in Katakana. While "Dora" is a shortening of the word "Doragon." Early on the series Ryuuji says that only the dragon can stay close to the tiger, so he will become a dragon to be with her. Ryuuji harbors a "Big Brother" mentality over Taiga, since she lives alone. To the point that he cooks for her, cleans her apartment and washes her clothes. Their relationship is built on a mutual desire to help each other so that they can be with the people they long for. Ryuuji has had a long time crush on Taiga's bestfriend Minori, while Taiga has had a crush on Ryuuji's friend, Yuusaka. Taiga is voiced by Rie Kugimiya, who won as best actress on this year's 3rd Seiyuu Awards. Other interesting trivia on this series is that the Yuusaka Kitamura was voiced by Hirofumi Nojima who also played Yasaburo Saotome in Macross Frontier. Also, nutty homeroom teacher, Yuri Koigakubo, was voiced by Rie Tanaka who played the main character Chii in Chobits. She also played Monica Lang and Miranda Melin in Macross Frontier. Yui Horie, who voiced Minori Kushieda, Taiga's bestfriend and the object Takasu's affection stole the show for me with her perfect portrayal of this bubbly character. Not only is the story and the quality of the anime good but also the soundtrack. The opening and ending songs are perfect for the series. The songs were sung by either Rie Kugimiya (Orange, Pre-Parade and Holy Night) or Yui Horie (Silky Heart and Vanilla Salt). I also liked the Christmassy "Holy Night" single sung by Kugimiya for their Christmas episode. Prior to Toradora, the last highschool themed anime that I watched that I truly enjoyed was Great Teacher Onizuka. Macross Frontier doesn't count because the highschool life was only touched lightly by the series. You can buy the DVD of the series here.